Cosmic Space turns itself into form according to its own desire. As mentioned earlier, the Source material called Cosmic Fire or Brahma Sutra is the thread of light or consciousness also known as “Luminous Nataraja.” The primal form is known as microabode in English. It is square at its base and cubical in structure with six sides. It is called Chidambaram in Sanskrit. This square pattern is the subtle unit of Space (anu) and is the shape of the subtle space contained in our heart known as Atman or Soul (some people refer to individual Atman as jivatman (embodied Soul) – but there is no difference so we use the term Atman). There is a creative hotness in this Cosmic fire called vaisvanara Agni or Cosmic Fire – the flame is blue. On the journey to manifestation, this subtle cube or microabode replicates itself through frequency or waveform by virtue of Absolute Time or Shakti. Thus, Absolute Time or Shakti is frequency, pulse, vibration or waveform. When this unitary cell goes into action, it splits itself into 64 or 81 smaller cubes or ‘padas’; this is called Vaastu Purusha Mandala. These fractional spaces unfold in sequential order as concentric square belts around the central point called Brahma Pada (luminous space-of fire), Devika Pada (space of effulgence), Maanusha Pada (space of awareness) and Paisaachika Pada (space of grossness). These concentric belts are wave patterns and form one large wave pattern. These 64 (in the 8×8) or 81 (in the 9×9) Padas that make up the energy belts have specific qualities and characteristics that, when stimulated by human activity, emit specific frequencies and then affect the human occupant based on those frequencies or qualities. Their role as emanations of consciousness cannot be overstated in terms of their effect on humans. Their qualities along with the five Elements guide the placement of rooms, doors, and activities in a Vaastu house. They are referred to as luminaries because they are direct luminescent energies born of consciousness or Brahmam. The Vaastu Purusha Mandala acts as a filter or grid through which the energy of Brahmam (light energy) passes and is fractionalized. That fractionalization splits the light consciousness and forms individuated energy forms – Padadevatas (Riks). Each of these forms has specific values and qualities that reflect in the building. And, each of these forms contain aspects of Cosmic knowledge. The individuated qualities of these cosmic forms is reflected within a diagram called Phalagunasruti – qualities of consciousness in seed form. In addition to OM light, OM Sound, the five elements and three gunas, these Padadevatas influence the occupant and thus the life of the occupant in innumerable ways. 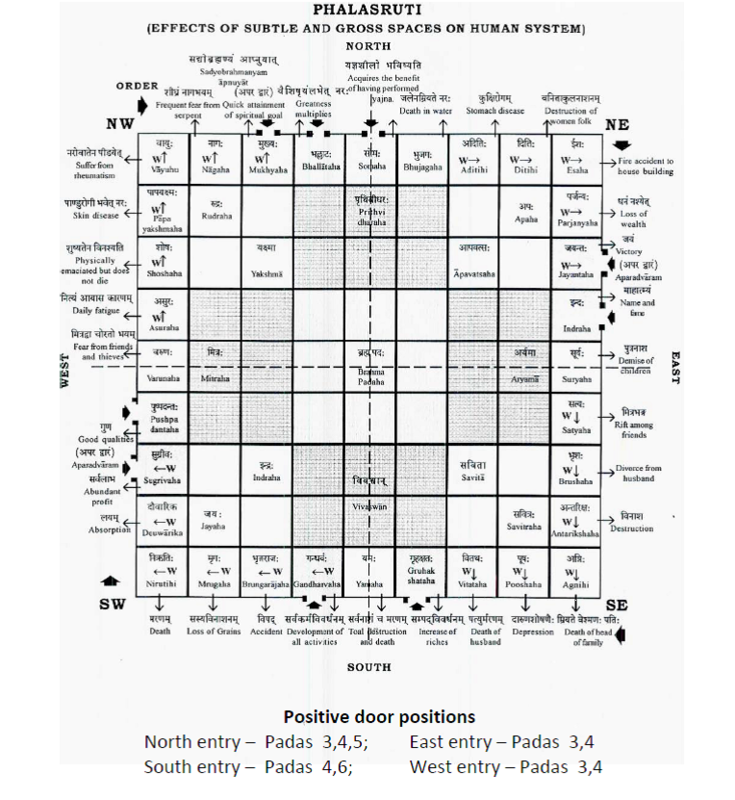 In the chart below you will see notations for the placement of front doors according to Vaastu Shastras. There are positive qualities derived from the placement of doors at certain padas that contain specific Padadevatas. You will note that doors placed incorrectly produce negative results. Does this mean that the Padadevata in that space is negative? No, not necessarily. It simply means that energy does not react well to the stimulation resulting from a door being in its place. Front door placement is indicated by broad arrows in the cardinal directions. The preferred door placement on all sides is the fourth pada from the corner going clockwise around the mandala from the Northeast. Contrary to popular belief the Vaastu Shastras make it clear that a front entrance may be in any one of four cardinal directions. Lack of knowledge of the Shastras has caused individuals and groups to propagate improper information on the topic of front door placement. Because they are unaware of the concept of “proper pada placement” they fear placing the door anywhere but the East. It is a fact that the door must be in the proper pada in each direction. Improper placement in any direction can bring mishaps to the occupant. The Padadevatas shown here are found throughout the Vedas and referred to as Riks. (The author is the first person to make this connection between the Padadevatas and the Riks in the Veda in modern times). It is said in the Rig (Rik) Veda that He who is awake the Riks will seek him out. The general concept here (stated in a simplistic way) is that in a Vaastu house, at some point when the occupant becomes attuned to the divine frequency of the house, Divine knowledge (divine experience – spiritual bliss) will come to him or her. This concept is explored more deeply during advanced training at the American University of Mayonic Science and Technology http://www.aumscience.com. This entry was posted in Science, Vastu and Vaastu Science and tagged architecture, articles, education, inspiration, philosophy, religion, research, science, thoughts by Ganesh. Bookmark the permalink. Please make the availability of the correct position of the door positons in the form of each direction:based on respective sketch :depending on the plot co-ordination. Manesh, you can more information on this from aumscience.com. I have given one sample plan from the earlier articles here. I read your article. after reading, i remained silent for few minutes. what i felt is – as the thumb impressions of 70 millions of the people of the world do not match each other. so is the fact of our impression and reflections about – the God, Absolute, Divine Shakti, Avatar etc. i feel that – ‘MAN CREATES GOD IN his own image.’ The aspects of divinity grow in the hearts of the people as they are. Wonderful! Thanks Sujan for sharing the wonderful words with us. very good article.what ” w” indicates in the diagram. I am planning to keep my Entrance door in South direction and the total measurement is 22 feet (Outer-Outer) , So if i calculate each PADA comes as 2.4 Feet (2 feet 4 inches) , But My main door is sized 3 feet , So, If i place my door on 4th PADA it is crossing 2.4 feet measurement , In that Case remaining 8 inches shall i borrow from PADA 3 or PADA 5. If you could clarify on this i can do modification to that immediately as the construction of my house is under progress. Wonderfully amazin text. Can you please suggest how do we check exact pada I am planning to buy house in south direction , but not sure which pada it is..
Can you please comment further on the 6th pada entrance for south direction? Normally only the 4th pada is considered permissible.